In May 1693, Alexander Spotswood enlisted as an ensign in the Earl of Bath's Regiment of Foot (later to be called the 10th Regiment of Foot) which was then in Flanders. A brief time later, he obtained a commission as Lieutenant in the same regiment. July 5, 1696, Spotswood, with his regiment, embarked for Ireland for a tour of duty. Writing to his cousin, John Spotswood, March 15, 1703/1704, Spotswood stated, "I have a Company in Lord North & Grey's Regiment of Foot, which is an Old Regiment & the same I have all along served in. I am also Lieut. Quarter Master General to all her Majesty's Forces in the Netherlands...." His cousin, John Spotswood wrote to Mrs. Mercer, Alexander Spotswood's mother, enclosing a letter to Alexander Spotswood and inquiring about the injuries he sustained August 2, 1704, at the Battle of Blenheim. (The image above is The Duke of Marlborough Signing the Despatch at Blenheim by Robert Alexander Hillingford). Alexander Spotswood described his injuries as so severe that his rib, collarbone and shoulder were broken and in April 1705 he was still under the care of the Chyrurgeon (Surgeon) and recovering in London. 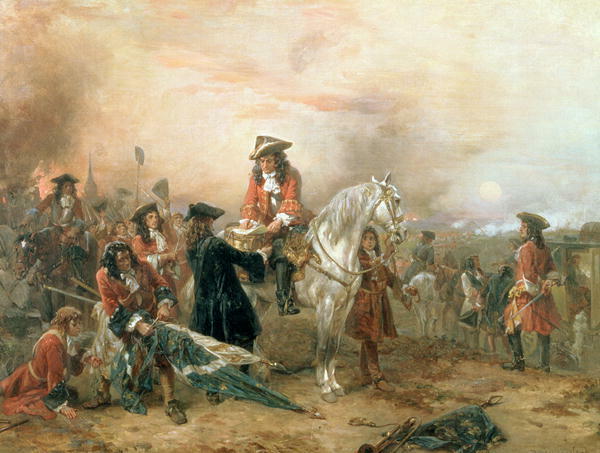 At the end of March 1706, Spotswood returned to his regiment in Holland. August 12, 1707, Spotswood was taken prisoner after his horse was shot out from under him and a Squadron of Horse deserted him. He was released in an exchange of prisoners in May, 1708. Returning to his military duties, he remained in the army until 1709 when he resigned his commission and returned to London. After Spotswood was settled in Virginia, he wrote to his cousin, John Spotswood, on March 20, 1711 N.S. about difficulties he encountered while in the army. In the first campaigns in which he participated, he felt that he had an excellent opportunity to improve his fortune because of promises made to him. As he recounted in his own words, the promises were "nothing better than a Will of the Wisp, which I follow'd during my last eight Campaigns through most excessive Labours & numerous Dangers, till at length quite tired out & sufficiently undeceiv'd how vainly a Man of Conscience & honest Principles pretends to thrive immediately under Those who think nought a Crime that works their Ends...." Further Spotswood told his cousin that he considered resigning after the Battle of Taisniere, but was persuaded to remain because "a Man of my Business was not so readily to be spar'd....I insisted upon immediate Performances, & protested that I would no more trust to their Promises."